It’s summertime and the livin’ is easy . . . but as some summers do, this has turned into a very, very busy one. Some of you may have noticed lengthy Wintersong absences. Since June we’ve had various family members visit us here in Utah, many of them for the first time. While it’s enjoyable reacquainting ourselves, it leaving little time for blogging, either my own or reading those on my bloglist. At this very moment, there are several adults and two teenagers in my kitchen and Hubby is making stick-to-the-ribs oatmeal pancakes to sustain one of the families departing for California. There are days Wintersong does not even make it to the computer the whole day, thereby for the first time in several years, there have been no winter songs. Posting my own, or visiting my own favorite blogs, has been sporadic at best. I assure you Wintersong is alive and well though, and will resume correspondence soon. 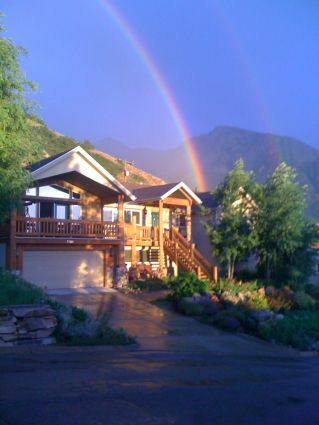 In the meantime, I’m sharing a digital photograph my neighbor across the street shared with us yesterday–of our house here in the Wasatch with a phenomenal double rainbow frame. Surely it’s a good omen. In the meantime, my muse is sifting through my thoughts of our final days in India (does everyone do this or is it just me?) and will resume as soon as physically and mentally possible. And by the way, thanks so much for comments I seem to have ignored. I appreciate every one! Have a great summer everyone! 🙂 Don’t call the cops; I’m not missing, just busy. Glad to know you’re in good health. I love the photo. WOW! What a beautiful picture of your lovely home. I have been far more sporadic than you, I fear. It is always nice to visit you via your cyber space. WoW! I want your house. Love the design, the yard, the setting, and yes, I want the rainbow, too. Can we make a deal??? As for the missing blogger, Rebecca’s Daughter has been lackadaisical at posting and reading, too. What happened to those lazy, crazy, hazy days of summer? I have been suffering from busyness of late. Ten days in Elly’s while she was away, gave me time to meet, have coffee or lunch with family and friends. I had time for walks, took photos and gathered blog fodder! In short, I had fun. How lovely! 😀 Of course I’ll be back–just as soon as I get “centered” again after a hectic 4 weeks! Lovely to hear from you! What a beautiful photograph. Enjoy your summer and your family. And you know, really you are just refilling the “ink well” for your blog. Can’t wait to read more about your travels though, so it will be nice when you’re writing again. Thanks so much, Michele! I’m glad to see you here! We’ve had overnight guests for almost a month, leaving me little time to contemplate–plus a little more travel–this time local–in between, showing off our southwest to family.